As a general rule, I don’t let anything take the place of the GLCE’s in my planning process. While tools like MC3 help me with pacing and unit organization, content focus needs to be on the standards always. Much as a law never supersedes the authority of the U.S. Constitution. From here, I can imagine what resources and thought processes will be needed in order for learning to take place. These standards take on various incarnations of essential questions depending on the particular unit and sub-unit content, so that standards are addressed incrementally over the entire school year. In my Main Event portion of the lesson, students actively engage with powerful learning resources through inquiry based strategies (DIQ tree-map) in a learning lab style. Tying Up Loose Ends is my formal assessment portion of every lesson. 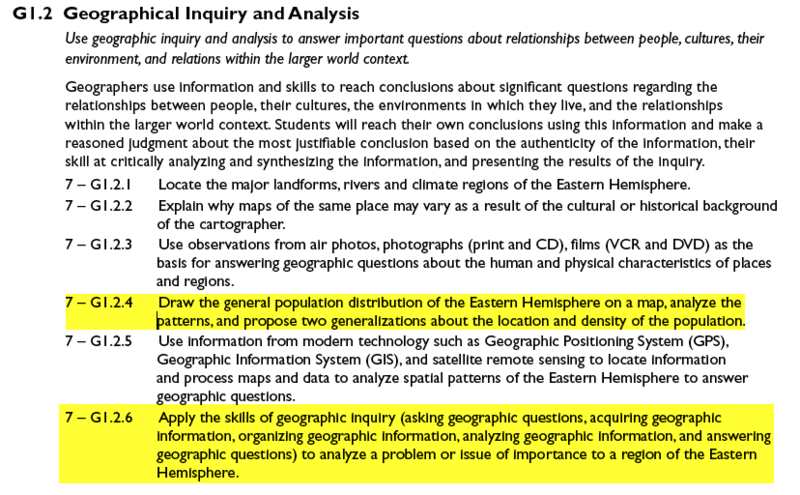 In this particular lesson, a quick write helps students to assimilate new knowledge with their own social views to construct hypothetical political policies concerning the relationship of population growth to resource consumption. This enhances the rigor of learning and taps into student interest because they can incorporate their own socio-political views.